Lenovo, today unveiled the latest evolution in mobile devices, the Lenovo PHAB Plus, a beautifully designed premium phablet, optimized for single-hand use. Targeted at today’s millennials, the Lenovo PHAB Plus promises to eliminate the dilemma of choosing between costly smartphones with big screens and underwhelming small tablets by offering a sweet-spot 6.8-inch device with best-in-class entertainment, speedy Internet, and all-day battery life. Lenovo’s PHAB series will also include a PHAB introductory model, offering a bigger HD screen at 6.98 inches. In addition to its unrivalled 4250mAh battery life, the device boasts a 360? Voice feature. Its three-microphone solution and dedicated voice processor ensure clean voice input and flawless on-speaker sound. Adding to its slew of features is 1GB of memory and octa-core Qualcomm processor, ensuring a responsive and smooth-running device. The PHAB is 8.9mm thin, 250g and features a color protective back which is available in Tuxedo Black, Polar White, Aqua Blue or Cherry Red. 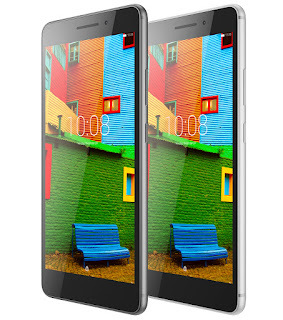 0 comments on "Lenovo PHAB Plus phablet redefines tablet + phone mash-ups"